Oh, how I love the way this monarch butterfly turned out. 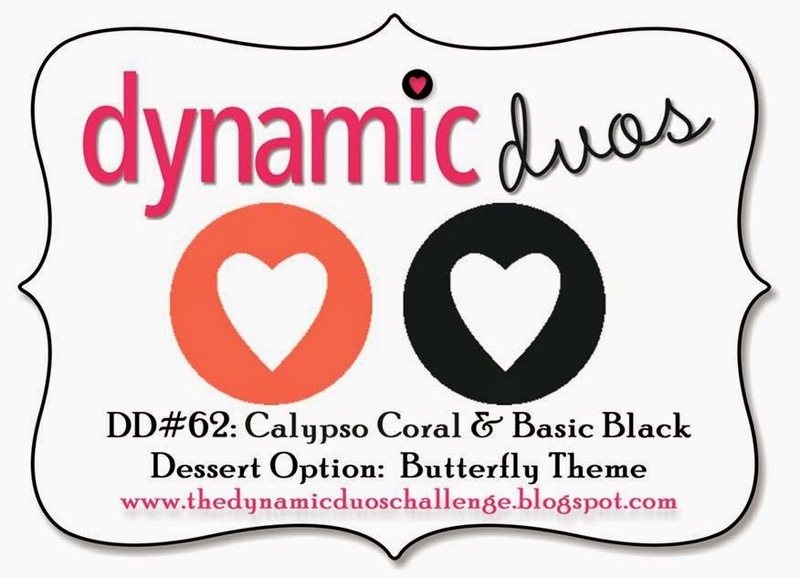 When I saw the challenge over at Dynamic Duos, which was Calypso Coral and Black with a butterfly dessert option, it screamed out to use this monarch image from Best of Butterflies. I used the sketch from Just Add Ink 175. The Calypso Coral DSP I used for the top background looks somewhat pink in the photo and looks so much better in real life. For the tag, I cut out a Chalk Talk tag from some Festival of Prints DSP. I added some swirls and butterflies with Soft Suede ink and then sponged the whole thing. I traced the outside of the die onto black cardstock and hand cut it out for the back layer. I like the effect it gave. Although I've been stamping for several years now (17 to be exact), and I've been wooed by a few Stampin' Up Demonstrators in the past, I finally bit the bullet and became a demonstrator myself!!! I am so excited! My sister-in-law has been a demonstrator for a few years and has recently landed herself a full-time teaching job. She has made the decision to step away for demonstrating for a while. It was the perfect opportunity for me to pick up where she left off.....after all, I was her best customer! I chose this stamp set called "The Perfect Blend" as part of my kit. I'm a sucker for anything coffee....I'm a big coffee drinker and lover! I mixed in a few stamps (the heart and "a latte") from another of my favorite old coffee sets called "Like It A Latte". The year on the set tells me it's from 2006. 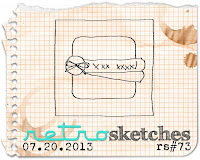 Retro Sketches #73 was my main inspiration for this card. I also used a couple of other new products on this card for the first time. The Crumb Cake background is splattered with Gorgeous Grunge stamps and then dry embossed with my Alphabet Press EF. I also added some punched chevrons from my brand new Chevron punch. Hey everyone! I've made this cute baby card for my cousin's son and daughter in law. They just had a baby girl. I think this color combo is so fresh and fun and now! 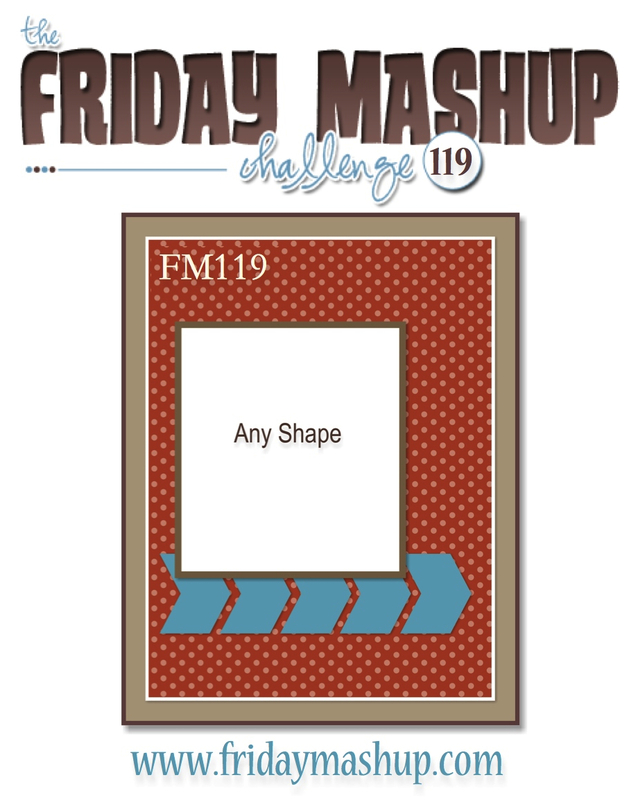 It's from Create with Connie and Mary Challenge 260. 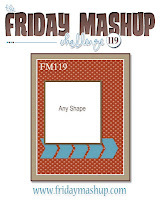 The Friday Mashup 119 asked us to create a card using a new stamp set and the sketch, which was somewhat similar to The Paper Players sketch 155. I know the Oh, Hello stamp set has been around for a while, but I just received it in the mail yesterday! I was excited to get to play with it. There is some awesome inspiration out there using this set! Good morning fellow stampers! I have some exciting news to announce! 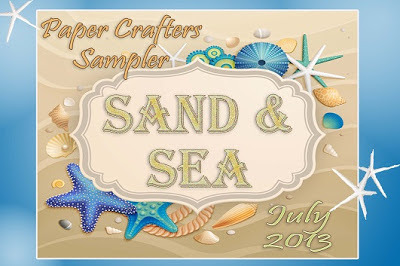 I am officially a design team member over at Paper Crafter's Sampler! If you haven't seen PCS before, on the 10th of the month you can get a new selection of SUO projects with step by step instructions (including 3D templates) designed by super-talented SU demonstrators. I can tell you the projects are fabulous - the theme for this month is Sand and Sea. So get ready to find some "cool" summer projects! The July issue offers an array of beach and sea loving projects. You'll find mini beach totes, colorful sunsets, salt water taffy containers, and images of sea life and seashells. This months template is Calypso the Seahorse. Here's a sneeky peek at my project. I made this card for one of my oldest and dearest friends for her birthday today. We are meeting tonight to have a picnic in the park to celebrate. I used the Mojo Monday 301 sketch and colors from Addicted to Stamps and More Challenge #53. I subbed Early Espresso for the Chocolate Chip and Gumball Green for the Wild Wasabi. 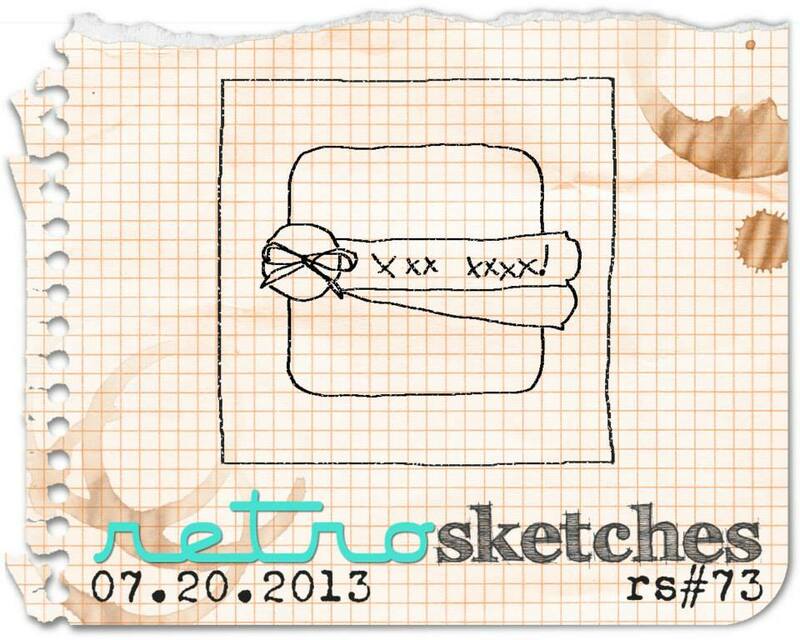 I started by using some of my brand new stamps, Chalk Talk and Simply Sketched. I love playing with new stuff and let me tell you, it feels soooo great to be creative again! I havn't had a ton of time for stamping lately, so I'm GIDDY to be at it again! I stamped the flower from Simply Sketched onto watercolor paper with Stazon Ink. I watercolored with a blender pen, markers and ink pads. I layered it under a Chalk Talk label that I had stamped with Early Espresso ink and cut out with the coordinating Chalk Talk die. I punch the center out with my 1 3/8' circle punch and then layered an espresso piece after I punched it with the 1 1/4" circle punch. This created a little frame. I popped up the Chalk Talk frame with dimensionals and layered it over my watercolored flower after sponging it. I stamped the For You in Early Espresso Ink, punched it out with the 1 1/4" circle punch, sponged it and layered over a sponged 1 3/8" punched Pretty In Pink circle. For the background, I ran a peice of Espresso Core'dination CS through the Big Shot with my Fancy Fan EF, then sanded it lightly with a sanding block. I added a chunk of pretty Gumball Green DSP and then a couple of DSP strips along the middle. An Antique Brad and some Crochet Trim finish off this pretty little number.